Home» VideoScribe» Community» VideoScribe questions and answers» Is it possible to have the elements pre-drawn? any pointers on how I can manipulate the settings in some way to accomplish this effect? PROBLEM: "I want an image somewhere on the canvas so that when the camera moves to that part of the canvas, the image is already there"
1) If there is already an element in the scribe, we'll call that element #1. put the camera facing element #1 or wherever you want it to be. 2) Add element #2 (the element you want to appear already drawn). Immediately click "set camera" so that the camera remains where it is in step 1. Then move element #2 far enough away from the previous camera position that it will not be visible to the camera from that position. Set draw time, to zero for element #2. Set the transition time to .5 seconds or whatever you want. Element #2 can be an SVG or jpg or png. 3) Add element #3. Move the camera to look at elements #2. with the camera still looking at element #2, select element #3 in the timeline and "set camera". (element 3 can be anything- preferably something with a small file size.) Then you can move element 3 somewhere off-camera if you don't want it to show. 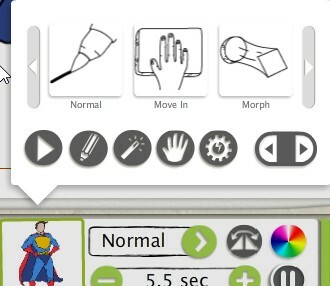 Also you can use "move-in" instead of "normal" to have the element slide onto the screen instead of being drawn. You can change the hand to "no hand" if you don't want to show a hand sliding the element onto the screen. The final image will probably always need to be a "dummy" image which does not get seen because its camera position looks at the previous image in the timeline.